Release Date: May 27, 2003 – U.S.
Have you ever been drawn to a certain actor without really knowing why? Randy Travis falls into that category for me. Was I the only one who thought he should have been cast as Sean Tuohy in "The Blind Side" instead of Tim McGraw? Probably. Like McGraw, Travis is mainly a country musician whose songs I've never listened to. Travis's career in the movies is more of a sideline, but he has amassed over 40 acting credits since 1992. He's also a much better singer than McGraw. Actually, I have no idea if that's true. 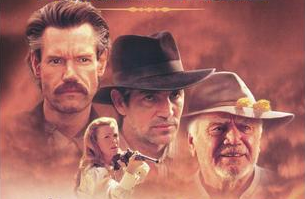 When I came across "The Long Ride Home," starring Travis, Eric Roberts (another inexplicable favorite of mine), and the legendary Ernest Borgnine, how could I resist? In the wild west of the 1860s, Jack (Travis) is mistaken for another outlaw (Paul Tinder) and forced to kill in self-defense. For the next eight years, he goes on the run. As the movie begins, he's shot unconscious and left for dead. His body is discovered by a mother, Laura (Vaughn Taylor), and her young son, Daniel (Alec Medlock). They take him in and nurse him back to health. Laura's love interest, Sheriff Hank Bowman (Eric Roberts), is out of town for a few days. How will he react to Jack's presence when he gets back? Meanwhile, a grieving father (Ernest Borgnine) and his two sons (Steve Nave and Jeff McGrail) want revenge on the gunfighter who killed the rest of their family – the same man Jack was accused of being years earlier. In a Western, accents are pretty important. Travis, the mother, and the boy each manage to do a respectable job, but it's all over the map after that. 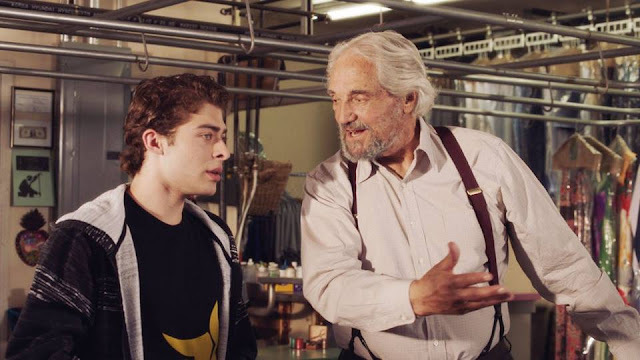 Borgnine gives it his best shot – he at least tries – but it's definitely strained at best. An early appearance from Jerry Doyle (fantastic as Garabaldi on the epic sci-fi TV series "Babylon 5") is wince-inducing, but he's Brando compared to what comes after. Garry Marshall doesn't even bother to hide his New York accent – but he's Garry Marshall, so it's impossible to hate him. Eric Roberts, to his credit, does deliver a heartfelt performance – even if it is mostly in his own accent. Authenticity clearly isn't this movie's number one priority. The boy is very good, but he looks several years older than his character, who is supposed to be 8. A quick look at IMDB reveals that the actor was 13 when the movie was released, which would presumably put him at 11 or 12 during filming. That disparity is laughably explained away with a tacked-on line about him being big for his age. It's hard to complain too much about his casting though – he is by far the most natural of all the performers in this production. The flashback sequences look like something out of a horror movie or soap opera – they seem ill-fitting and jarring for this type of film – yet they have a certain nightmarish quality about them that isn't entirely unsuccessful. "The Long Ride Home" is obviously not a great movie – it's a mixed bag, for the most part – but the story and some of the better actors help carry it along. Even more remarkably, it manages to be entertaining despite a complete lack of overt violence, bloodshed, or profanity. That didn't dawn on me until after the fact, which means I was sufficiently engaged in the material while I was watching.